The geometry of the chess board. 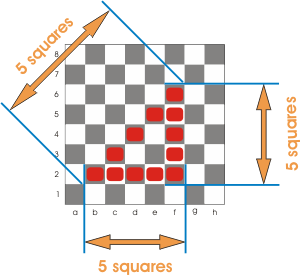 The space in chess (the chess board) is made up by the 64 squares on which the pieces move. As you may have noticed, this space is fragmented unlike the contiguous space from our world with which we are all familiarized . 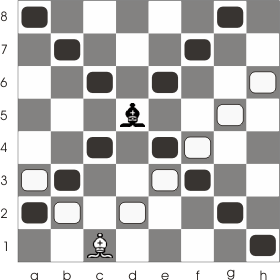 The fact that space in chess is fragmented gives it some special properties. Look at the images below. 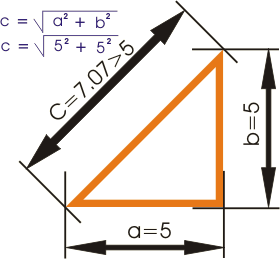 According to Pythagoras the length of c is greater than the length of a or b (this is in the normal space, which is contiguous). But in the fragmented space on the chess board all those distances are equal (that means that the distance on the lines and columns is equal to the distance on the diagonals) This is very important to know especially in pawns endings. There is another important thing you should know. A piece has an absolute value (the ones we've talked about in the articles on which we presented each piece) and a relative value (given by the position of the piece on the board). The strength of a particular square is given by the number of the pieces that control that square and by their value and ,at the same time, by the pieces that occupy that square. At the same time the relative value of a piece is given by the position of the square it occupies. 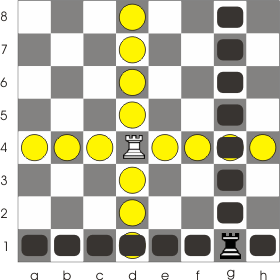 As you can see from the next images the range of action of a piece is larger when it occupies the center of the board and shrinks down if moved near the edge of the board. 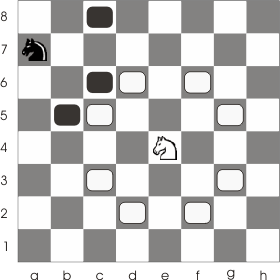 The only piece that doesn't follow this rule is the rook which's range of action is the same regardless of its position on the board. This is why the central squares are more valuable than those on the edge of the board and that is why most games have as their long term plan the objective of controlling the center.